Card of the Day ~You’re On The Right Path~ This card jumped out of the pack as validation that your thoughts and actions are in the right direction toward achieving your life’s purpose and inner peace. You’ve been carefully listening to your guidance from within, and the angels applaud you for following it faithfully. 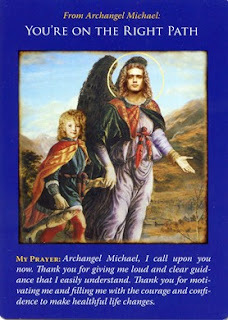 Although you may not clearly see what’s up ahead, the angels want you to know that they’re guiding and protecting you every step of the way. Keep up the good work! It all comes down to having faith and you should feel good about yourself because you have faith that you are doing the right thing, that you are on the right path. We all feel lost from time to time and that’s when you call on your angels to give you a sign you are on the right path still. I pray you have a fantastic day. I love you all!